Skimmia (Skimmia japonica): growing, planting, caring. A shrub from Asian undergrowth, perfect for city gardens with its evergreen foliage and moderate size. Skimmia japonica is a species of flowering plant in the family Rutaceae, native to Japan, China, and Southeast Asia, growing to 6 m (20 ft) tall and wide, and widely cultivated as an ornamental plant in gardens and parks. Its fragrant flowers can be cream-yellow to white, followed on female plants by small, round, red - but toxic ! - fruits. The plant tolerates a wide range of conditions, including frost, drought, and atmospheric pollution. There are 4 species of cultivated skimmias, but the most common is Skimmia japonica. 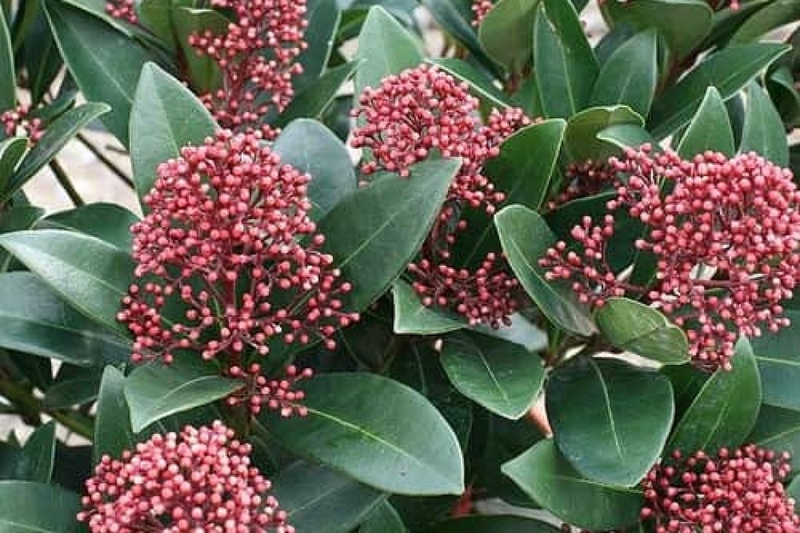 The Japanese skimmia is a shrub of heathsoil that withstands shady situations The leaves are evergreen, lustrous, oval, alternate, green, sometimes purple, alternately organized on the branch. The clusters of small white and very dense gold flowers appear in the spring. They turn into red berries that persist throughout the winter. The shrub itself measures up to 6 meters for the botanical species, but there are small cultivars of about sixty centimeters. Skimmia likes rather acid soils! But do not panic if your soil is rich in limestone: culture in a pot will allow you to enjoy this beautiful plant. Plant it in April or early fall. The skimmia appreciates a half-shaded or shadow exposure: it will prefer a north-west orientation. In addition, it resists rather well to the frosts. Skimmias can be planted as a group, as a massif, as a hedge or as a border. They can also be grown in pots, on a terrace or on a balcony. Unpot the plant. Gently detach the roots from each other, making sure they do not cross each other. Put the root ball in a bucket of water to rehydrate the plant. Make a large hole, about half a meter wide, then crumble the soil that you removed and mix it with heather earth - about 1/3 of earth for 2/3 of heathland. You can also add sand and potting soil if you have some! Discard some organic fertilizer for heather plants at the bottom of the hole. Arrange your plant in the middle of the hole. Take care to spread the roots at the bottom. If your soil is too calcareous, you can put a "geotextile" layer at the bottom of the hole to create a "pocket" of heathland soil. Fill the hole with heathland, then slightly tamp the ground, and water abundantly! The skimmia's main demand is water! The soil must stay cool, even during summer. Thus, it must be generously watered regularly with softened water. At the end of summer, you can space out the waterings. Be particularly attentive to potted azaleas: the surface dries faster, and the plant has very little reserves: a dry bout will be deadly! One thing: you should form a hollow at the base of the shrubs and then spread out a 10 cm thick layer of mulch. In the spring, water in the morning, and in the summer, in the evening after the sun has set. If you can, avoid hard water! An easy solution is to collect rain water... If in doubt, add fertilizer for heather from time to time to help solve the problem. If this plant had a favorite mulch, it would be bark and pine needles! They provide the acidity that the plant is crazy about. A mineral mulch is also possible, if you have any pieces of slate, break them into little shards that you'll be able to use as a layer. Otherwise, mulch with compost especially for young plants' first years. For young plants, during the first two winters and in the coldest regions, it is wise to protect them with a mulch made of wood or dead leaves. Each year, after flowering, trim the ends of the twigs that were bearing the fruit, to keep your skimmia compact. Your skimmia, if it is in pot, will appreciate new shoes, every 3 or 4 years! Repot at the end of winter. Take out the root ball by tapping the edge of it. Lay the mound on the side, then with a sharp knife cut the lower third of the root ball: the root system is thin and dense and it is easy to reduce its size. Then remove a crown of roots and soil on the perimeter. You will have reduced the rootball by about half. Place a layer of gravel at the bottom of the pot for drainage, and repot in a mixture of earth and heathsoil with a little sand. Finally, tamp and water copiously. A few days later, you can do a light thinning pruning. Skimmias are subject to mealybugs, which sting the leaves and make them wither. If there are really too much, treat with black soap to make them fall.